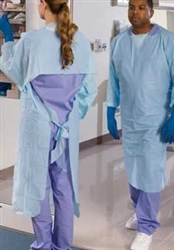 HiRisk Impervious Gowns are disposable medical gowns that provide comfort and protections. These gowns are impervious and made from soft embossed polyethylene which provides a level of protection against infectious materials. These gowns are light blue in color. HiRisk Gowns feature an open back for increased comfort and airflow. They have a closed loop neck that allows the user to slip on over their head and tear off quickly. They also have stirrup cuffs that keep the gown in place so wrists are protected from fluids and infectious materials. Gowns are one-size-fits-most. HiRisk Disposable Isolation Gowns are for: blood drawing, inserting IV’s, instrument leaning and sterilization. For use in: Isolation, Trauma, Burn Units, Critical Care Units, Central Sterilization, and ICU. HiRisk Gowns are latex free offering a hypoallergenic gown solution.